An example of active and dynamic stretch would be Essentrics. Instructors always remind participants to keep moving and avoid holding a stretch, because this won't improve flexibility or lengthen our muscles. For many people, this is confusing and seemingly contradicting. We have always learned that stretching improves flexibility, so why would holding a stretch reduce it? To understand this, let's see what happens when we hold a stretch. Our body has many reflexes to protect us from injuries. For example, our balance/righting reflex helps us to stay erect and upright. If we are displaced from an upright position, our visual, vestibular (hearing) or somatosensory (tactile) signals evoke commands from the brain to correct our posture. In the same way, spinal reflexes protect our muscles from tears and our tendons from excessive tension. Let's look at how our muscles and tendons are connected. Muscles are connected to bones at both ends via tendons. 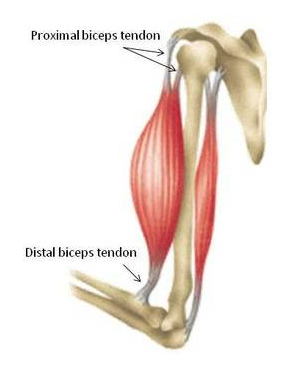 An example are the biceps and the bicep tendons of our arms. 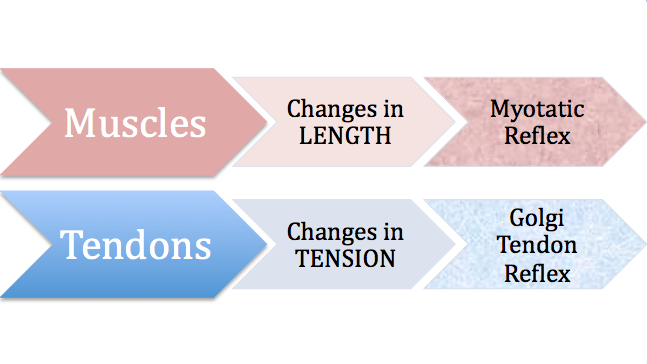 Muscles have receptors (muscle spindles) that react to changes in LENGTH and the RATE of change. Where muscles and tendons converge, there are also receptors (Golgi tendon organ) that react to TENSION. When we stretch our biceps and hold, we change its length which triggers the myotatic reflex ("myo" means muscle). Stretching too fast also triggers it. The triggered reflex means our biceps contract in order to avoid overstretching and tears. That's right - our muscles CONTRACT to keep their length when we hold a stretch. This contraction creates tension. Where our tendons converge with muscles, there are receptors (Golgi tendon organ, or GTO) that detect such tendon tension. 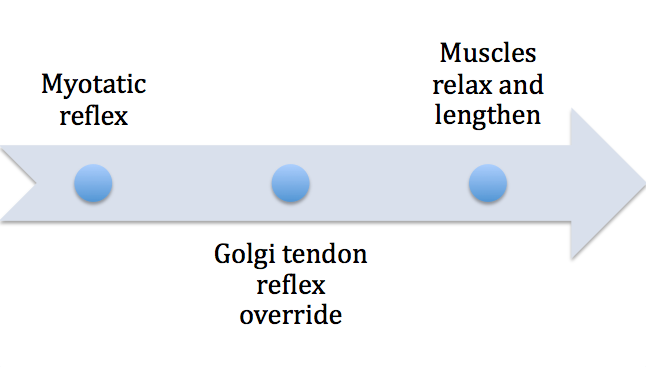 If we continue holding a stretch, the built-up tension in our muscles will eventually trigger the Golgi tendon reflex. This overrides the myotatic reflex, causing our biceps to relax and lengthen from their contracted state. Static stretch therefore only lengthens our muscles if we hold it sufficiently long to trigger the Golgi tendon reflex. This can take fifteen, twenty, or thirty seconds. It creates contractions which must be offset before muscles can possibly lengthen. This can be time consuming if we are trying to improve flexibility for the whole body, especially if we have limited time and wish to achieve other fitness goals such as strength, cardio health, mobility, balance, speed, and power. In the case of dynamic stretch such as Essentrics, we stay in motion at moderate speeds, thereby avoiding the myotatic reflex. By extending and retracting smoothly and repeatedly, we signal to our muscles that our movements are safe, and they respond readily to lengthen throughout the process. This is how we improve flexibility. For certain movements, Essentrics instructors may ask us to extend our muscles, give it a second, then extend a bit further, give it another second, and finally extend to the end. This is a neuromuscular technique we use to signal to our muscles that we won't overreach, allowing the myotatic reflex to subside. We can then lengthen our muscles to their natural limits. Understanding the mechanisms behind the different stretching approaches help us to more effectively work our body. We can perhaps appreciate why Essentrics instructors always remind us to stay in motion! While some Essentrics movements might seem static to beginners, they aren't - we should always deepen each stretch progressively, even if by only a minuscule amount. Think of counting three, for example, before you get to the end of a stretch. (A common mistake is stretching on the first count and then holding during the second and third count, triggering the myotatic reflex.) This incremental approach is how we achieve our maximum flexibility potential!